Guinness World Records recently unveiled the world’s largest videogame controller at London’s Liverpool St. Station, and Nintendo Universe were there to check it out. 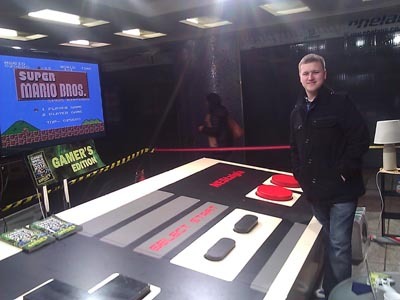 Measuring up at a rather sizeable 366 cm x 159 cm x 51 cm (12ft x 5ft 3 in x 1ft 8 in), which equates to thirty times the size of a standard NES controller, the device is the creation of British Engineering student Ben Allen, currently studying at Delft University of Technology in the Netherlands. Co-creators Stephen van ‘t Hof and Michel Verhulst were also in attendance, where commuters and press were invited to play classics such as Super Mario Bros. and Tetris. The device, which was created as part of a university project, took 5 months to create with an estimated cost of £4,000. “This is really a labour of love”, Allen explained. “We’re passionate about gaming and wanted to honour its most iconic device; the NES (Nintendo Entertainment System) joypad. We put our heads together in the pub and decided to create this absurdly large working version! Guinness World Records Gamer’s Edition 2012 is currently on sale, and available from a majority of retailers.